The Ballaarat to Melbourne Classic is a social bike ride from Ballarat to Melbourne, raising funds for the Pallister-Killian Syndrome Foundation of Australia. Rider sign-in / departure (Ballarat, location TBA) 9:00 – 10:00 am. Lunch at Greendale Pub from 12:00 noon. Scheduled arrival at Federation Square around 6:00 pm. Riders will receive a map and ride notes, identifying checkpoints to be visited on the route from Ballarat to Melbourne. The checkpoints have been selected so as to provide an enjoyable route on quiet country roads and bike paths from Ballarat to Melbourne. Riders can follow the suggested route, or take an alternative route of their own. The suggested route is about 150km long, from Ballarat (approx 420m above sea level) to Federation Square in Melbourne (10m above sea level). There are some significant hills along the way, both up and down. Riders who do not want to attempt the full distance from Ballarat to Melbourne are encouraged to ride shorter distances. Ballan (36km), Bacchus Marsh (67km) and Werribee (105km) are logical start and finish points, as they are all well serviced by trains. 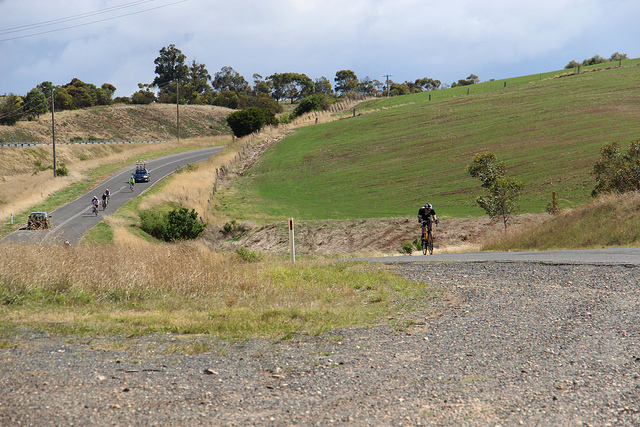 The section from Ballan to Bacchus Marsh, via lunch at Greendale Pub, is highly recommended to all riders. Riders who find themselves struggling on the day can withdraw from the ride at the same points. Regardless of the distance ridden, all riders (and supporters) are encouraged to join us at the finish, at Beer Deluxe in Federation Square, Melbourne – easily accessible from Flinders Street station. Riders must register through the Ballaarat to Melbourne Classic event portal on MyCause. Riders are expected to be self-supporting with appropriate tools, spares and know-how to get themselves to the finish line. A support car will be available in case of emergency. If numbers permit, a coach (with bike trailer) will be available to bring riders from Melbourne to Ballarat for the start of the ride, and/or from Melbourne back to Ballarat after the ride. If coaches do not run, we recommend catching the train to or from the ride. Trains running on the Ballarat line have spaces allocated for carrying bikes. The Melbourne to Ballarat Classic is one of the world’s oldest bike races. It has a long and proud history of over 100 races. It’s an iconic race, but as a social ride it leaves a lot to be desired. They ride uphill, against the prevailing wind, on a freeway, at the coldest and most miserable time of the year. They don’t actually start in Melbourne, and they don’t stop at a single pub, cafe or bakery along the way. The Ballaarat to Melbourne Classic aims to right all of these wrongs. The inaugural Ballarat to Melbourne Classic was ridden on 23 March 2013. Some 28 people battled howling tailwinds and braved the gruelling descents to cover some 150km (allowing for navigational inconsistencies) from Ballarat railway station to Federation Square. Our pilot-scale event in 2013 raised a modest (but well appreciated) sum of money for PKSFA. This year we’re aiming higher. More riders. More sponsorship opportunities. More shameless begging. Supporters can sponsor individual riders, or the event as a whole, through the Ballaarat to Melbourne event portal at MyCause. Corporate sponsorship opportunities are available. Contact us to discuss how you can help support PKSFA and the Ballaarat to Melbourne Classic. The modern day city of Ballarat occupies part of the Ballaarat sheep run, established in 1837. The official spelling of the town has taken both forms at various times, and the foundation stone on the town hall names the city with the double “a” spelling. Although the universally accepted modern spelling is with a single “a”, the double “a” form is occasionally used, usually for purposes of pretension. The Ballaarat to Melbourne Classic is a strong supporter of all things pretentious, and proudly adopts the double “a” spelling for 2014. This entry was posted in Events and tagged 2014, ballarat, bike, fundraising, melbourne, ride by Tim Paton. Bookmark the permalink.